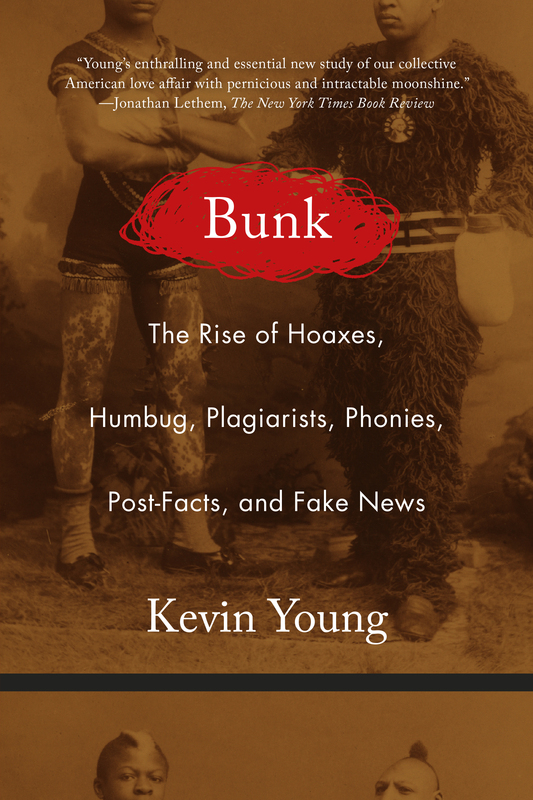 Kevin Young’s Bunk is an absolutely delightful, well-researched journey through the minefields of “Hoaxes, Humbugs, Plagiarists, Phonies, Post-Facts, and Fake News.” From the public’s gullibility that made P.T. Barnum rich to Internet trolls, scam telephone calls, and lying politicians, there is a “sucker born every minute” and someone more than willing to exploit every one of them. It is no wonder that www.snopes.com and www.politifact.com are so sorely needed today. The glorious Bunk is a must-read book for those who wish to understand a world in which the click of a button can spew lies and hate into the minds and hearts of too many of us. 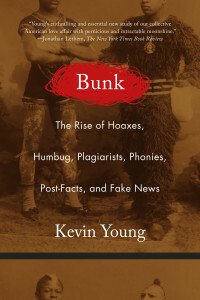 From P. T. Barnum to Donald Trump, the range of hoaxes, lies, and their perpetrators is extensive: Bunk discusses the Moon Hoax, Spiritualism, Mutant Message Down Under, Piltdown Man, Lance Armstrong, the Hitler Diaries, Jayson Blair at The New York Times, Rachel Dolezal, and politicians, among many other topics. These are just a smattering of the cases Young treats with due respect and scholarly attention while placing each incident into historical context. Central to Young’s thesis is an exploration of their relationship to issues of conflict and race. So what happens when the hoaxer or plagiarist is exposed? Young asserts that the “Five Stages of Grift” result: denial, redirection, admission to a lesser mistake, and a half-hearted confession. The final stage in these modern times is often “publication of a new novel—or a book-length confession—or the combo platter” which posits the real confession in the form of fiction, thereby never really admitting culpability. It would seem that modern politics seldom gets beyond the first two stages before skipping on to the talk show circuit to flog their new book. Let’s consider just one of the many opportunities to illustrate the myriad hoaxes discussed herein. Barnum’s genius lay in his ability to make “the audience part of the hoax….” That is, he invited the public to pay their money to “come see and decide for yourself.” Joice Heth was the first in his ever-growing stable of humbugs: she was a blind black woman that Barnum advertised as the former nursemaid to General George Washington. Throngs came to see — and literally touch — someone who had held the Father of the Country. Heth died in 1836 after only one “workaday winter.” But Barnum was still not to be denied one last chance to profit. He ordered that her body be autopsied in a large surgical theatre and charged fifty cents to a sold-out show. “Barnum parlayed the doctor’s unsurprising conclusion that she was not actually 161 years old, but of ordinary advanced age into the sale of more papers and as proof of his first successful humbug.” More money resulted. Originally published in 2017 to widespread acclaim, Bunk is now available in paperback. Kevin Young is director of the Schomburg Center for Research in Black Culture, author of eleven books of poetry, and poetry editor for The New Yorker. His previous nonfiction book, The Grey Album: On the Blackness of Blackness, won the PEN Open Book Award.